I spent a week in Dublin recently at the National Archives, the Valuation Office and the Registry of Deeds. What did I discover? To recap – there were two important landholding records. The Tithe Applotment Books (1825-37) and the Griffiths Valuation (1847-64) were used for taxation purposes. We can only glean who the head of household was, unlike census records in which the whole family is listed. Unfortunately most of the pre 1901 census records were destroyed in 1922 during the Civil War. In the National Archives they hold the notebooks used in Griffiths Valuation and these hold all the detail which was summarised in the final document in 1853 for the civil parishes we are primarily interested in. The notebooks available for these parishes were the Tenure Books and they yielded some really good stuff. They showed the occupiers pre 1848, in 1848 and in 1851. In the Valuation Office are held the Cancelled and Current Land Books which show all changes in holdings from 1859. The Registry of Deeds added nothing to our store of family knowledge but I did make some progress on our family’s landlords’ events. Before I launch into names you might like to look at the latest version of the family tree via the link above. I suggest you print a copy to help with all the names in this article. 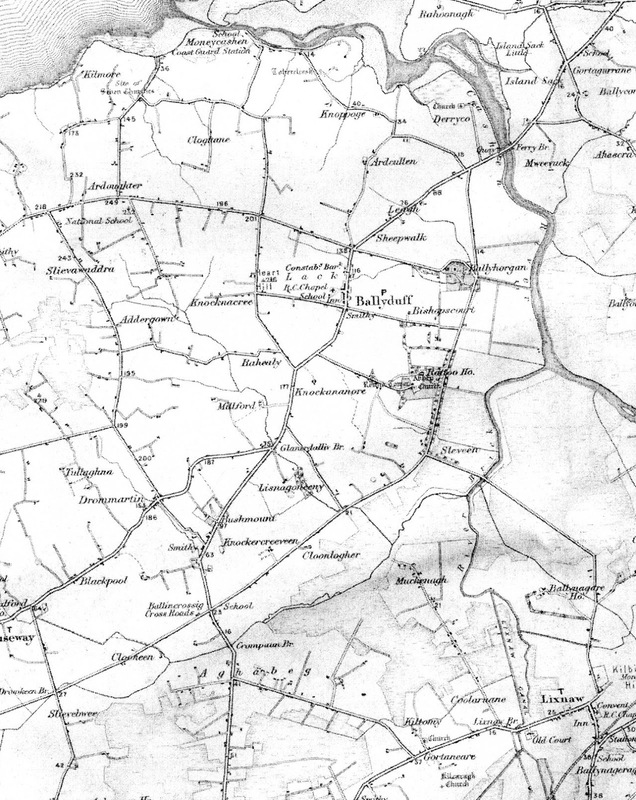 The map below from the 1841 Ordnance Survey will also acquaint you with the main townlands we are interested in. We already knew that Sylvester Donoghue was on a smallholding just behind the church on the west side of the village. He only paid £1 rent. His son Bartholomew was on another adjacent piece of land called Madegan’s Holding paying £2 p.a. Sylvester’s brother Bartholomew was over on the east side and paying £11 so it must have been a larger plot. By this time Sylvester and both Bartholomews were no longer in Ballyduff. Where did they go? However living in a house & garden at no.3 is Jude (or Juliana) Donohoe and she is living rent free which suggests a special relationship with the landlord Thomas A Stoughton as I have not found many such cases. Living next to her at no.2 is Paddy Donohoe. He is probably James and Julia’s son who married Catherine Dee from Knoppoge. Living next to Paddy is a Simon Halloran about whom more later. The most interesting find was over on the east side in a very small townland called Farranedmond. I suspect this may have been where Bartholomew was located in 1824, only in his case the area was called East Benmore. In Farranedmond I found our James and I suspect his son Thomas (called Tom), my great great grandfather, on holdings described as house and land at a rent of £5 p.a. So it appears that James and Juliana were occupying two properties with two sons next to them. Paddy has gone and his property is occupied by Thomas Ryle, the husband of James and Juliana’s daughter Mary. James and Thomas are no longer shown in Farranedmond and their holdings have been taken over by Simon Halloran, whose wife is Mary Boyle, almost certainly Juliana’s niece. They must have been close. What happened to James? One imagines he had either died or had moved back into the village with Juliana. We know Thomas left for London in 1851 so where did he and his family go in the interim? Judith (or Juliana) Donoghoe was still in the village and her rent was shown as ‘free during her own life’. Simon Halloran is still next door in a house and land and paying £18 rent, including Farranedmond, with a new lease granted in 1850. Mary Ryle is in a house and land at £3 p.a. Julia, by now well into her 80s, is no longer in her house in 1860/1 and the property appears to be split between Mary Ryle and her husband or son, Thomas. Simon Halloran has left the village. Where had he and his family gone? In my blog ‘The Search for Juliana, Elizabeth and Joanna Boyle in Causeway Parish’ I tried to work out which townlands these Donoghue spouses came from: Elizabeth from Ballincrossig perhaps and Joanna almost certainly from Sleveen. As you can see from the map these places are very close to each other. But I could not come to any conclusions about Juliana – until I realised the close relationship with Simon Halloran and Mary Boyle. She must have been a favourite niece of Juliana’s and the evidence suggests the family was from Knockercreeveen between Ballincrossig and Sleveen. All these Boyles must have been related to some degree, living in such close proximity, but that’s beyond me at this stage! This is the case for Knockercreeveen. A Mary was born in 1818 to Patrick Boyle and Catherine (aka Mary) Cooke. She was the first of seven children born between 1818 and 1840: Mary, Helen (or Ellen), Thomas, Juliana, Patrick, Joanna, Honora. Simon and Mary were sponsors to Honora. Judith (or our Juliana) Boyle was sponsor to Joanna. As an aside, childbearing went on for many years in Irish Catholic families, 20-25 years is not uncommon. Patrick is the holder of 38 acres in 1825 and is paying a rent of £50 p.a – a comfortable farmer. This also suggests that he was the eldest son and that the family was well established in this townland. A Daniel Boyle and Catherine Tuite also had two recorded children in Knockercreeveen: Juliana in 1817 and Bridget in 1821 with James and Mary Boyle as sponsors. Two earlier girls, Ellen in 1809 and Margaret in 1814, were born in Benmore/Ballyduff, with Patrick as a sponsor. So I think we have two of our Juliana’s siblings in Patrick and Daniel with James and Mary as potentials as well. We find James Boyle in Tullaghna (a mile north-west of Knockercreeveen) married to Bridget Trant. They had three recorded children: Juliana in 1823, Patrick in 1825 (with Patrick Boyle and Mary Cooke as sponsors) and another Julia (the first must have died) in 1832 with Thomas Boyle as sponsor - probably another of our Juliana’s siblings. Simon and Mary had their first two children - Mary in 1839 and Elizabeth in 1841 – in Knockercreeveen. Two more, Maurice and Mary (the first one probably died) were born in 1845 and 1847 in Glanerdalliv down the road towards Ballyduff and then in 1850 Samuel in Benmore. I have only found one other Simon Halloran in Kerry and this family was some distance away. Now that I feel reasonably comfortable that I have made good progress on the Boyles I will move on to the other spouse families. My priority ought to be Ellen Connor, my great great grandmother, but this will be a real challenge as there are so many Connors in north Kerry. I may try the easier ones first! Looking at the tree I will see what I can discover about Mary Flahive, Bridget Ferris, Catherine Dee, Maurice Nelan, Mary Scanlan, Ellen Johnson and their families as the next phase. We know where Thomas Ryle came from because I am contact with a Ryle of today who also has Thomas and Mary on his family tree. We have reached a stage where we need to put all these families on the many genealogical message forums, so that is a task for this next period. It will also be clear from what we have learnt to date that many of these folk, particularly the Donoghues and Boyles, may have left Ireland so a search of the many Passenger and Immigration sites is also needed. I will do a future blog on why and where our people may have gone. Thank you for this interesting information. Thomas and Mary Ryle are my direct ancestors. They are my GGG Grandparents. It appears that Thomas and Mary had another child in 1864, Patrick, who immigrated to the United States in 1880. I am uncertain if either Thomas or Mary did the same. Great to make your acquaintance, Christian. Where are you? I don't think Thomas and Mary emigrated as Mary died in Ireland (see my August 2015 blog). Where was Patrick born and is he your ancestor? Do you know Gerard and Sean? Yes, Patrick Ryle is my Great-Great Grandfather. I currently reside in Washington State, United States. I'm not sure the exact location in Ireland he was born, but I would assume it would be Ballyduff or someone in the near vicinity. He immigrated to Chicago, Illinois in 1879 or 1880. There are conflicting documents, but he was born between 1861 and 1864, married Nora and had 3 sons and 2 daughters, my Great-Grandfather, John, being the oldest. I do not know Gerard and Sean, unfortunately. Thomas and Mary remained in the village to the best of my knowledge as she was very close to her mother, my ggggrandmother. You mention conflicting documents do they all show that Patrick's parents were Thomas and Mary Donoghue, Christian? Patrick's birth date of 1861-4 is feasible as Mary would have been in her early forties but about ten years after her last child. And also what were the names of his children please? The conflicting documents or more about Patrick's age. There are a few documents at his time of death that point solely to Thomas Ryle and Mary Donaghue being his parents, but no documents prior to death. I've found a few pieces that might suggest that Patrick moved to Illinois to live with his aunt and uncle (along with another even younger sibling, Bridget), maybe because Mary was in old age. And perhaps the reason his age fluctuates in a few documents is because he lied in order to get work, but that's just a hypothesis. Second son James fits to our family as under Irish naming practices second son named after maternal grandfather who was James Donoghue. We are not sure who Thomas's parents were but Patrick's children would suggest it was a John. Are you saying Patrick had an even younger sister Bridget? What were the names of his aunt and uncle please? I was not thinking straight in my last note and was one generation out. Patrick should have named his first son Thomas and first daughter Mary if naming practices were followed. However perhaps traditions were eroded by moving to US. My last two questions stand however. "Rod, I think Christian's ggg grandparents are in fact Thomas Ryle (Shoemaker) & Bridget Mary Donoghue Castleshannon & Heirhill. Check out their details and you will see Patrick among others, born 1860. Thomas and Bridget both die from Typhus ? (Bridget age 47 ,1879) Patrick and sister Bridget show in 1880 in Quincy,Adams,Illinois with Bridget Mary's sister, Mary Donoghue Shehan. Bridget m. Baldwin in US d. Cook, Chicago 1941?,Patrick d.1920 Chicago,Cook ?,Catherine m to Birmingham d.1921 Chicago Cook, so the Illinois connection is quite apparent. There is also a Denis (m. McNicholas ?) knocking about in Illinois. He is most likely a son of Michael Ryle/Ellen Neil, Ballyduff. Ryles, Castleshannon and Donoghue, Heirhill must be related to Thomas Ryle / Mary Donoghue Ballyduff but I am not sure of exact relationship on both sides. Perhaps you could track down the Donoghue connection better than me. I think Thomas Ryle Ballyduff is an uncle of Thomas, Castleshannon..."
Thank you very much for the more accurate information about my family history!